Fukushima’s star turn in Center Court was just the beginning. Later that evening, he, along with Washington, D.C., restaurateur Yama Jewayni, presided over the first Great W&M Asia Cook Off. 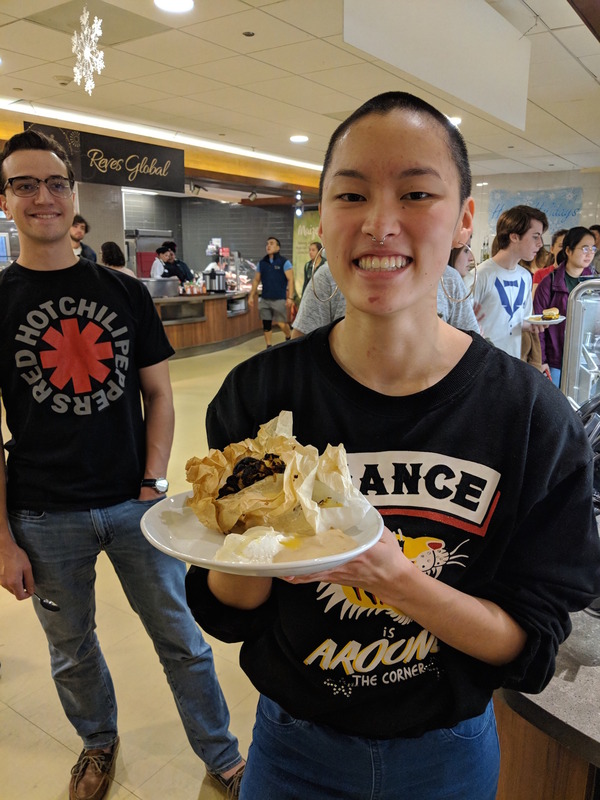 Ten teams, comprised of students from Professor Stephen Sheehi’s The History of Arab Food and East Asia Think Tank courses, presented dishes to the judges, while also offering a brief history and cultural context for each dish. These events were the brainchild of Sheehi, a professor of Arabic studies and a scholar on the cultural and political economy of food. The participants were all part of the Freeman Fellowship Program, a venture privately funded through the Freeman Foundation’s contributions to the For the Bold campaign. These students spent six to eight weeks in East Asia completing internships that allowed them to reflect on political and social issues facing their host country. For Sheehi, these experiences made these students the perfect ambassadors for Middle Eastern and East Asian cuisine. “This is a chance for students to literally hold culture in their hands, while also getting to learn and share the history and cultural context,” said Sheehi. The winners of the Cook-Off were Maddy Mulder ’21, Daria Moody ’22 and Maeve Naughton-Rockwell ’21, who won for their presentation of sikbaj, which Sheehi describes as a classical but now-extinct Abassid Arab dish. Made using a 14th century recipe, the dish contains meat, eggplant, raisins, almonds and spices. The runners up presented Zalook, a Moroccan eggplant salad with Arab flatbread seasoned with zaatar. For their part, the students were thrilled to have Fukushima on campus and were excited to try his culinary creations, even if they weren’t well-versed in Asian cuisine.